InStyle Magazine has an article on 10 ways to streamline your morning. When it suggested something that required a $78 headband I knew this article was written just for me. 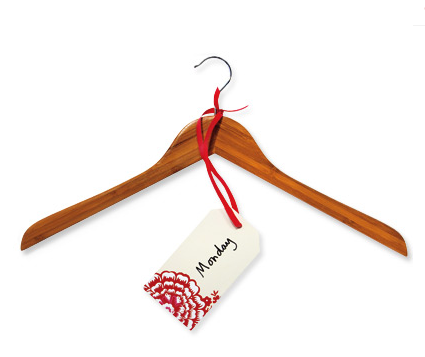 My favorite tip was on Sunday night when I go over my calendar for the week (let’s see Monday go to work, Tuesday go to work …) I should pick out my outfits for each day and put them at the front of my closet with a DIY tag labeling what day that outfit is to be worn. You know I’m way too busy on Sunday night being depressed that it’s Sunday night to go over my calendar and pick out my wardrobe. 1. Hit your snooze alarm until when you finally get out of bed you only have 5 minutes to get ready. No time to dilly-dally. 2. Sleep in the outfit you are going to wear the next day … sure you’ll look like a mess but you have streamlined your morning. 3. Drink a gallon of water before you go to bed … you will get up really fast in the morning (and probably a couple times before then too). 4. Sleep with a dog that hogs the bed so when you wake up you are clinging to the edge of the mattress for dear life. 5. Fix your breakfast the night before and have it at the kitchen table. Sure that cereal will be soggy, the oatmeal cold, the toast hard, the OJ warm but hey its the price you pay for a streamline morning. 7. Set out everything you need to take with you the night before. This will allow you that extra time to look for your keys that you are sure you put right there last night. 9. Explain to your dog that you can only allot her 7 minutes in the morning to get her business done. She will understand and will be totally cooperative. No really. 10. Don’t write a blog that you post on every morning. It will only derail you from that train we call streamline. Once you sit at the computer you’ll be checking your Facebook account, your Twitter account (@swellgalmary), your emails (mary@maryhirsch.net), going on YouTube to watch something stupid. Well I hope I have helped you in your quest for a better morning. Now get yourself a $78 headband and get moving. Boy was it hard to get out of bed today. I pushed that snooze button over and over again. Even Freckles didn’t want to get out of bed — of course Freckles never wants to get out of bed until she hears me pour food into her dish. Nothing gets a body moving like a bowl of meat by-products. In my next life I want to be a bear and sleep all winter and wake-up in the spring. Of course there would be those pesky hunters who want to kill me for fun, those crazy philosophers who keep asking if I poop in the woods (like, duh, is the Pope Catholic?) and those creeps who want to capture me and make me wear funny clothes and do stupid things in a circus. Where are the hunters when you need them? I finally am back on line. I did all the usual steps when I can’t get on line and nothing worked. Sat on hold for 40 minutes waiting for Comcast to tell me it’s not their fault and transfer me to Apple. The wonderful woman at Apple got me up and running in about 5 minutes. I love Apple. So yesterday I’m at the grocery store and I remembered its resolution time. I stopped making resolutions — well the traditional resolutions (I’ll lose weight, exercise, get taller, keep my condo clean, find a cure for cancer, and be nominated for a Nobel prize in physics). This blog I guess is my New Year’s resolution. Actually its my need to do something other than work, walk the dog, and watch television. It is so easy to get in a rut. I love to write but I come home and say “Oh I’m too tired to write.” You know it’s not like I was out pulling a plow or digging ditches or chasing children for 8 hours. I sit in an office at a computer and every once in a while I have to walk from the 16th floor to the 15th floor and then back up the stairs, but that’s about it. The truth is not that I’m too tired, its just easier to lay on the couch with Freckles and watch whatever is on. So I’m hoping that this blog will inspire me to do even more writing. So back to the whole grocery store and I remembered its resolution time — I got sidetracked as usual (shiny object, shiny object) — the first of the year you will always find the Lean Cuisine on sale, along with other “diet” products. Every other commercial is either for Alli, Weight Watchers, Jenny Craig, Lifetime Fitness, or some other weight loss/get in shape project. Having been overweight all my life, and having lost as much as 100 pounds at one time, I can tell you what the secret to weight loss is — being happy, creative, and liking yourself. If you don’t like yourself at 280 pounds, you aren’t going to like yourself at 120 pounds — I guarantee it. Okay, I’m going to spend the day picking up — I have a tendency to let things fall and stay. I even bought a gift wrap organizer to put my leftover Christmas paper in. Maybe this is the year I get organized — oh I crack myself up.